According to the analysis, Los Angeles County by far faces the biggest threat with 1.5 million homes at risk, followed by Orange and Santa Clara Counties, which have around 582,000 and 354,000 homes in the line of danger, respectively. Los Angeles County has faced 42 major wildfires since 1960, and the latest round of fires in December 2017 caused a 25.0 percent year-over-year decline in available inventory. Orange County has had 14 major wildfires over the past five decades and also lost a quarter of its inventory. Lastly, Santa Clara County has only had six major wildfires since 1960, but the latest fire slashed available inventory by half. 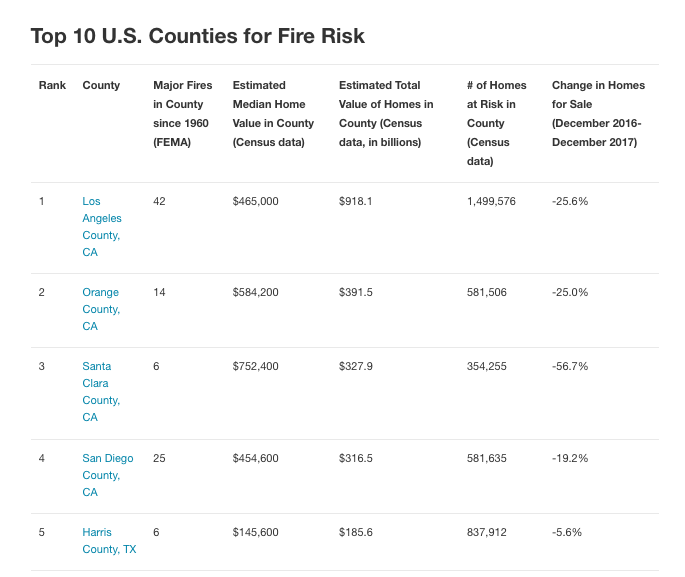 San Diego County, California, and Harris County, Texas, rounded out the top five highest risk areas, with inventory dropping by 19.2 percent and 5.6 percent year-over-year, respectively. 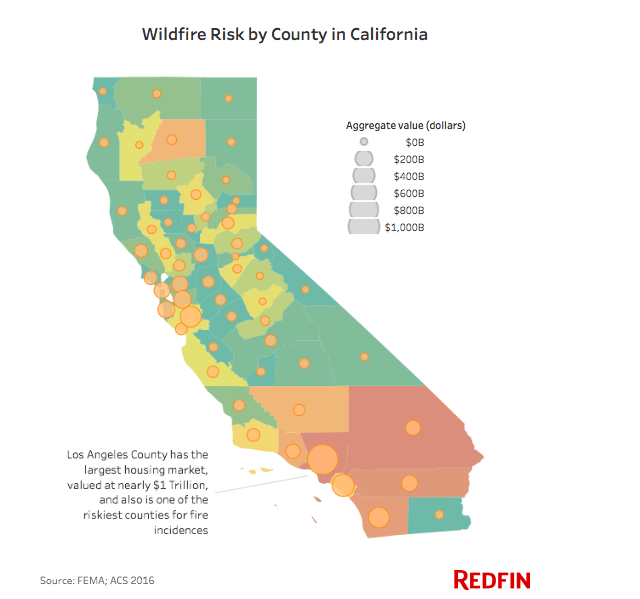 “Restrictive zoning and underbuilding make wildfires even more damaging for homeowners and renters in affected areas. Despite strong demand and severe inventory shortages, California has built the fewest number of homes per new resident of any state, with just one unit for every four new residents, compared to one new unit for every 1.8 new residents nationally,” said Redfin chief economist Nela Richardson in a statement. Despite this major risk, Santa Rosa-based Redfin agent Starling Scholz said in a statement that homebuyers are willing to take the gamble because of the other luxuries California offers, such as “beautiful weather, nature and well-paying jobs.” Venti reminds homebuyers to invest in fire insurance (which many homeowners in California are finding more difficult to obtain and afford) through their insurer or sign up for California’s FAIR Plan property insurance, which is for homeowners who have been denied coverage elsewhere. “California FAIR Plan property insurance may be able to provide insurance for homes that have been denied coverage,” he said. See where your county ranks here.